Learning to write letters the same size, with ascenders (the tall strokes of 'b', 'h', 'k', etc.) and descenders (the ‘below the line’ parts of 'p', 'q', 'y', etc.) the correct relative size, is no easy task. Children also need to learn to write on a line (or in straight lines across a blank piece of paper), which takes time and lots of practice. 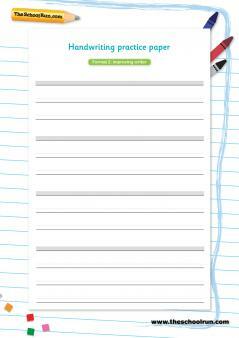 Our blank handwriting practice paper is designed to help improve your child's handwriting skills when they are writing a selection of words of your choice. The penmanship paper is available in two formats. Both have shaded areas to show your child where to place the small letters ('a', 'e', 's', 'o', etc.) and the lower parts of letters such as 'h', 'b', 'k'). If your child is learning joined writing for the first time Format 1 (New writer) is probably the best choice. If your child is older and normally writes in a smaller size, Format 2 (Improving writer) is probably the best choice. Encourage your child to sit their patterns on the bold base lines and make them a consistent size; they will need to make the ascenders approximately twice the size of the small letters and the descenders the same distance below the line. The paper has no guide lines to mark the heights of ascenders and descenders; encourage your child to judge their size by eye (this is because once guide lines of this kind are removed children who are used to using them often make their tall letters touch the writing line above, cluttering the horizontal space between the lines and making their writing hard to read). When your child understands the relative sizes of the letters and can manage to keep the sizes consistent without the help of the guide lines they are ready to use normal single-lined paper. Make this change as soon as they are ready. For a step-by-step learning journey of handwriting worksheets, from first patterning to joined-up writing, see our Handwriting Learning Journey. For expert advice and information about improving your child's penmanship read our handwriting articles and videos.